-->Siri Mitchell has written five novels two of which (Chateau of Echoes and The Cubicle Next Door) were named Christy Finalists. A graduate from the University of Washington with a business degree she has worked in many levels of government. She enjoys traveling and has lived on three continents. 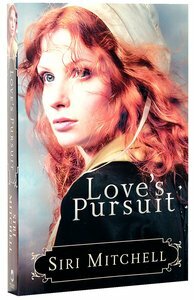 Customer Reviews For "Love's Pursuit"
Not so predictable . . . I've gotten used to the predictability of so much Christian Fiction . . . so this one surprised me! I enjoyed learning about the Puritans whom I haven't read much about in the past. The old English style has a bit of a Jane Austin feel to it. This novel has left me wanting to find more from Siri Mitchell. I really liked it.